The purpose of today's demonstration is to show how Chimera can bring together diverse data for viewing, comparing and analysis to provide insight on on a specific molecular system. The demo is meant to convey how an individual researcher working on a specific project might use the multi-faceted Chimera capabilities. Insight comes from combined use of multi-modal data and deep analysis of individual data sets. Chimera is especially strong in producing integrated views of data. 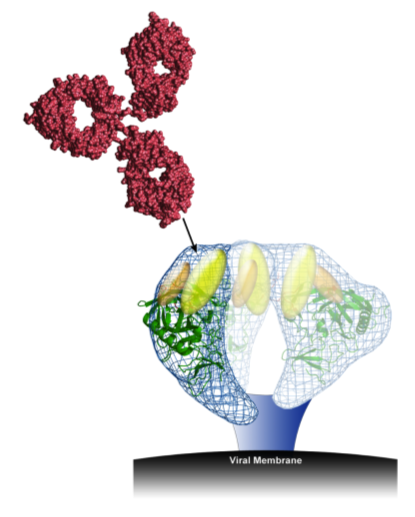 Inspiration: September 2009 Science paper announces discovery of two broadly neutralizing antibodies renewing hopes for an antibody-based vaccine. Screened 1800 patients, 30000 B-cells from one patient. Two new antibodies PG9 and PG16 have significantly higher affinity and neutralize more HIV strains than all previously known HIV spike antibodies. Only alanine scanning data has been published for PG9 and PG16 (no structures), so we will explore complexities revealed by earlier data on HIV spikes and anti-body binding. Aim is to show multi-modal Chimera analysis. 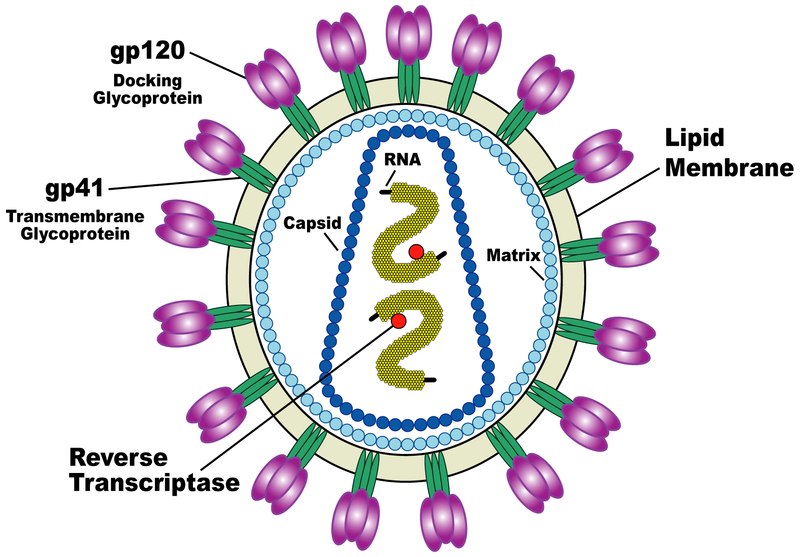 HIV spikes are trimers (tulips in image): gp120 recognizes human T-cell receptor CD4 to target infection. 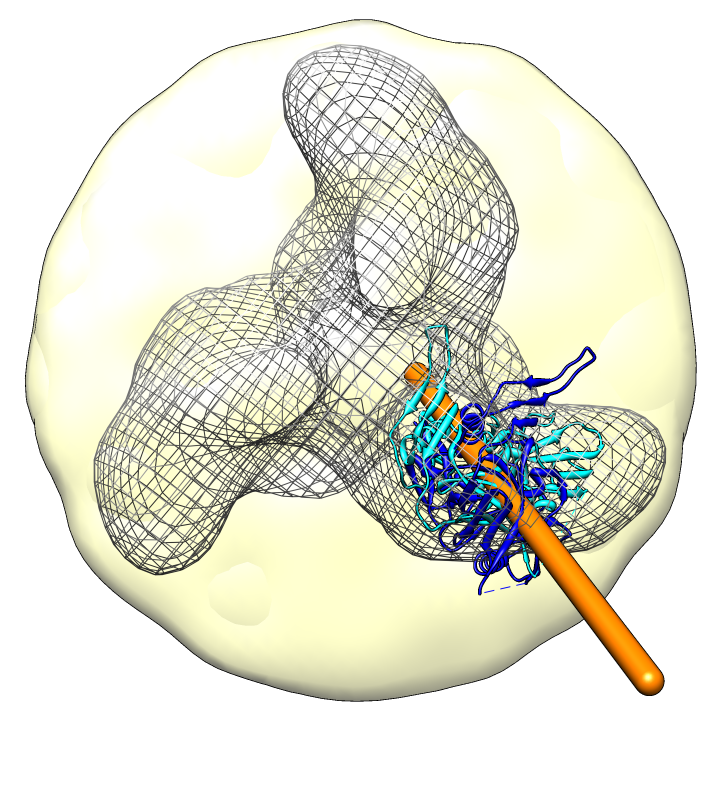 gp41 is transmembrane stalk of spike responsible for fusing virus and cell lipid membranes. New anti-bodies bind to gp120, only in trimeric form. Web browser keyword PDB search gp120, 86 hits, many with no gp120, CATH Hits tab, 16 gp120 structures. 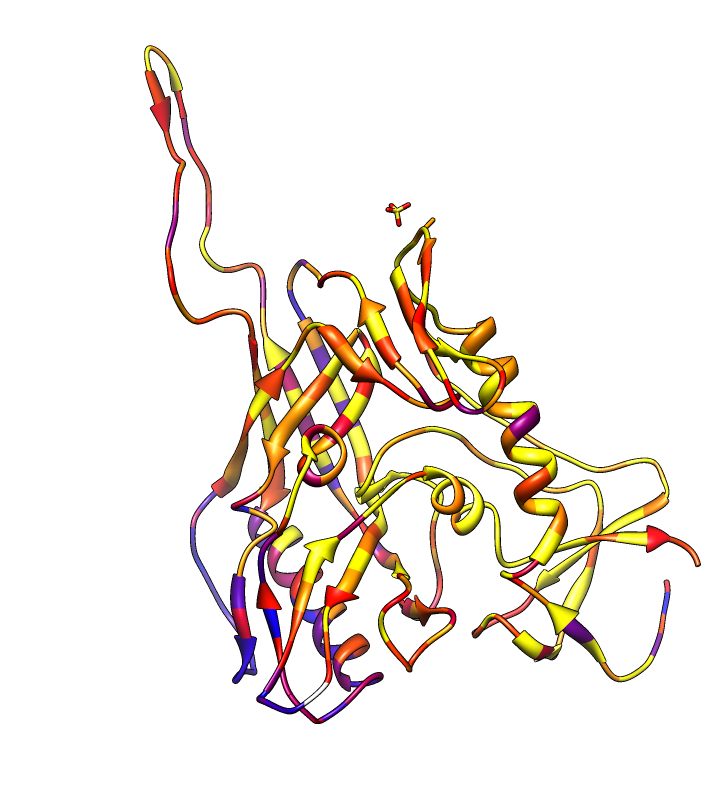 Chimera fetch 1gc1 directly from RCSB, oldest, often cited structure. Sequence of gp120 shows unresolved residues in density, loops V1/V2 and V3 were replaced by Gly-Ala-Gly. Future plan: pull annotations of domain and loops from RCSB automatically. PDB 1gc1: gp120 blue, antigen binding fragment (FAB) 17b yellow and red, CD4 cyan. 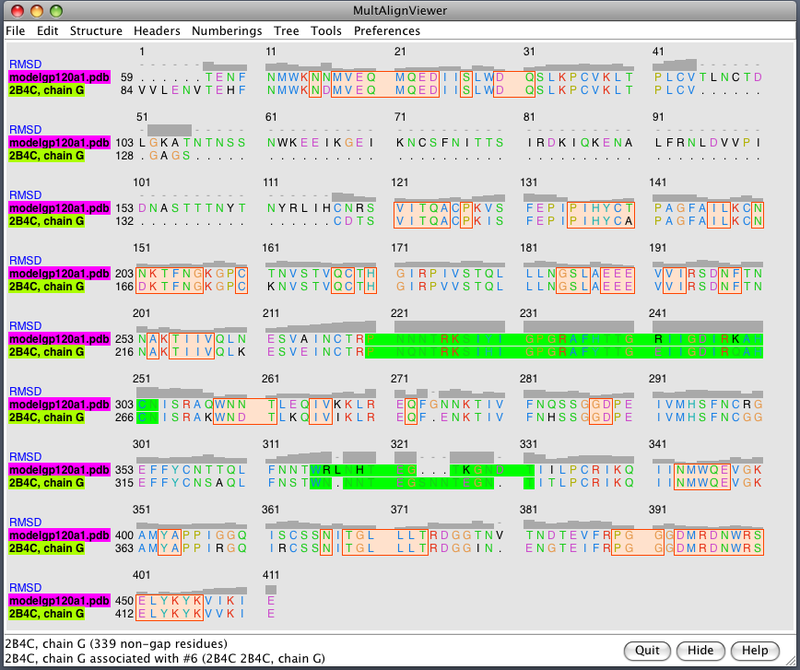 Sequence gp120 (1gc1 chain G): missing segments red, helices yellow, strands green. gp120 structures found with BLAST. BLAST 1gc1 gp120 sequence against PDB using Chimera. 56 matching chains, 26 structures. Aligned structures. Fetch some structures found by BLAST. Automatically aligned. Structure with V3 loop. 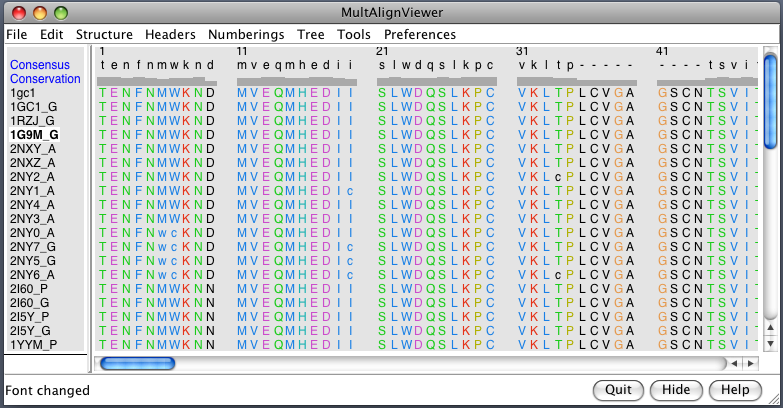 Sequence alignment shows 2B4C has V3 loop, only one other structure has it. 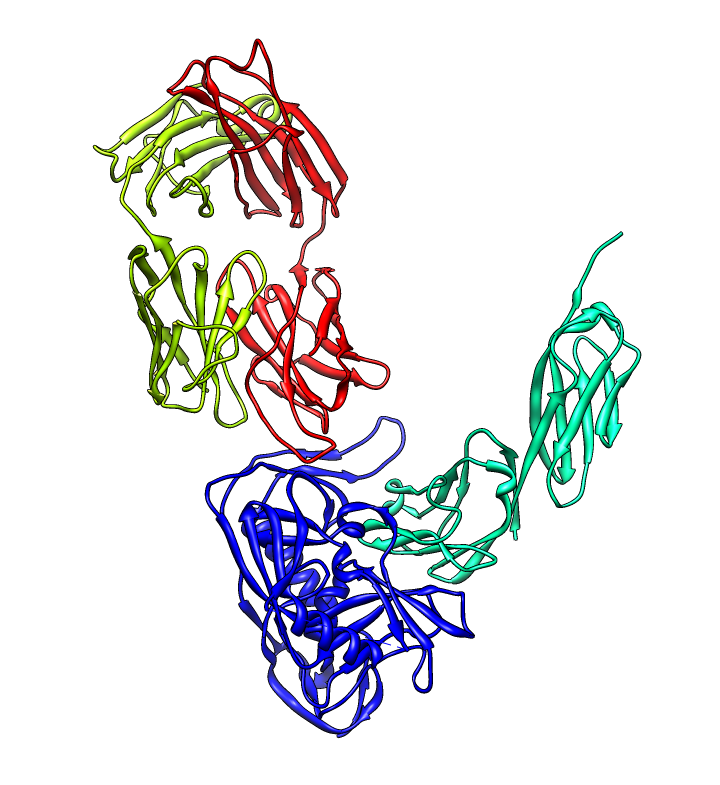 V3 loop recognized by many antibodies. Opening diverse set of HIV sequences allows mapping degree of residue conservation onto structure by coloring. Conserved residues must be recognized by broadly neutralizing antibodies. Best match of 2B4C is to clade B sequence, 43 errors. Percent identity is ~80% to clade B, 70% to other clade sequences. HIV clades. 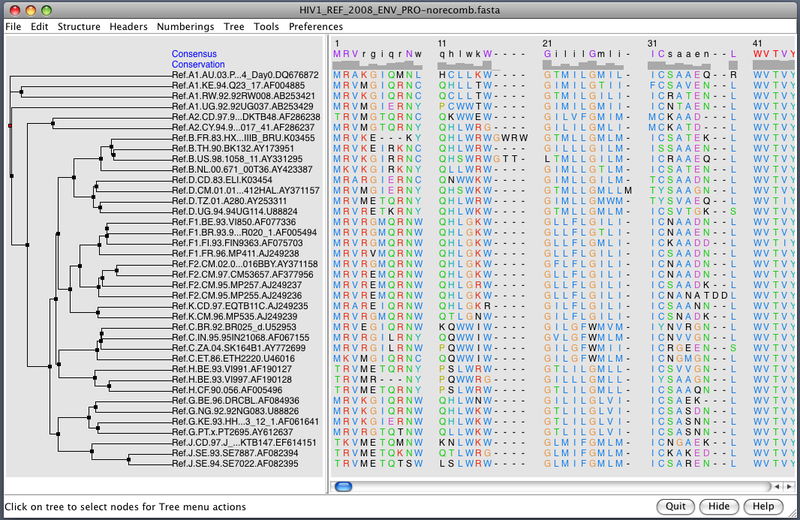 38 reference sequences from LANL HIV database. Clades in sequence names. Phylogenetic tree at left. Cross-clade conservation. gp120 colored by residue conservation, yellow-red-blue most to least conserved. Change of antibody affinity when individual residues mutated to alanine reported in 2009 Science paper. Alanine scanning. Reduction in binding affinity of PG9 and PG16 when residues mutated to alanine shown as blue sequence headers. Critical binding residues. Fatter tube at residues where PG16 binding reduced by substituting alanine. Most HIV infections are in Africa caused by strains in clades C and A.
America and Europe, most infections strain B, but only 10% of total infections. 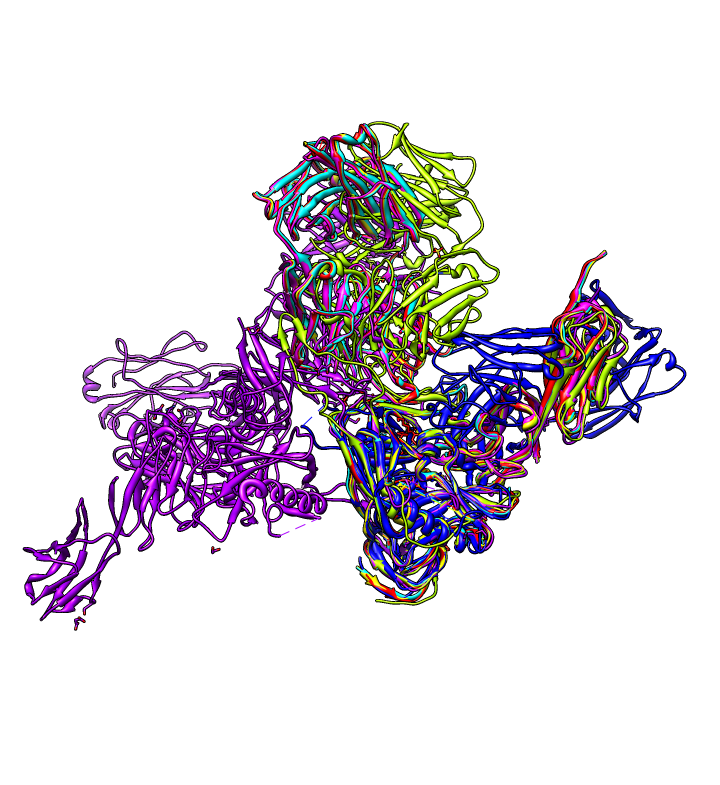 What clades to PDB gp120 structures belong to? All belong to clade B (America/Europe). 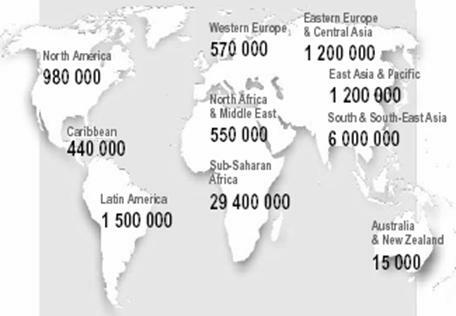 Geographic distribution of HIV clades. HIV infections, 2002. 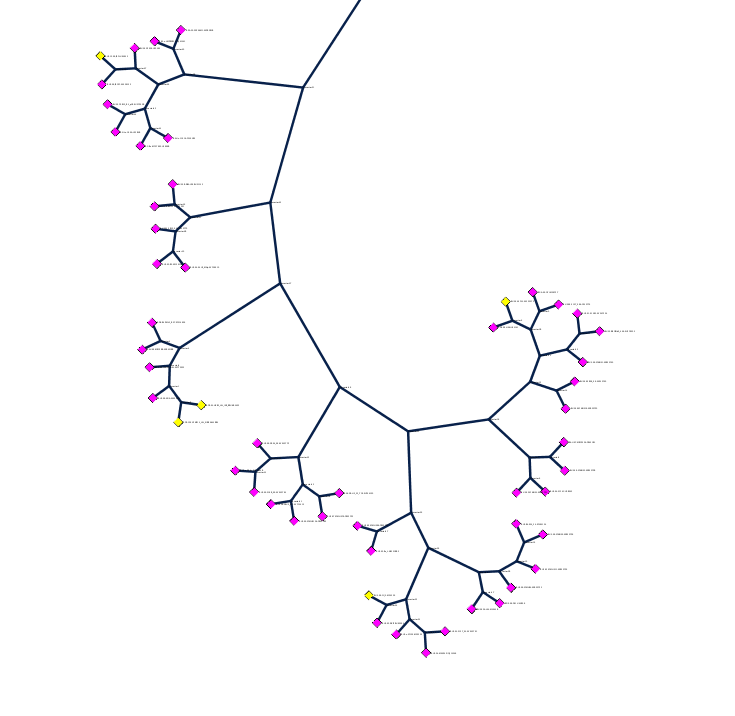 HIV sequence tree: 1900+ HIV sequences from Los Alamos National Laboratory (LANL) HIV database viewed using Cytoscape network visualization developed by RBVI. Clade B pink, clade A cyan, clade C red. All PDB gp120 structures are in yellow boxes. 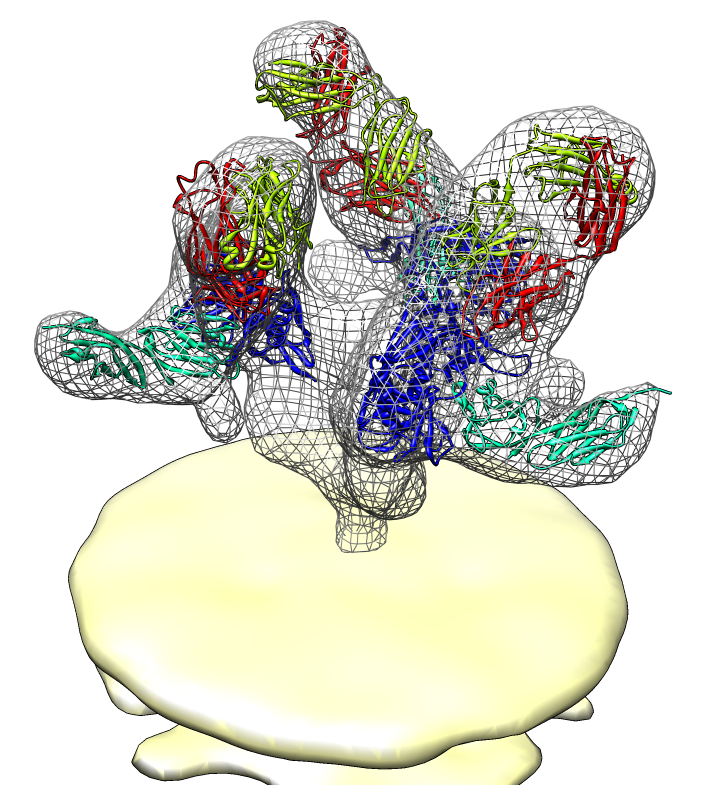 Close up: All but one of the gp120 sequences found in PDB structures (17 of 18 unique sequences) match the 5 HIV isolates shown here as yellow nodes. This region of is the left yellow box in full network image. PG9 and PG16 binding location: Supplementary figure 6 from Walker LM, et al 2009 Science paper. 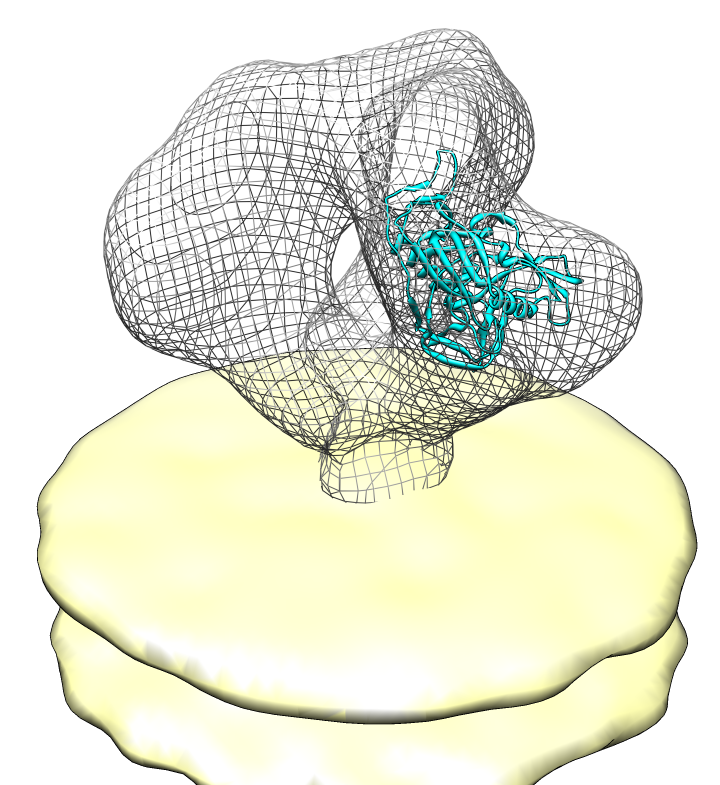 Binding is hypothesized to be to v1/v2 loops (yellow) and v3 loop (orange). Homology model: gp120 ModBase Q9YQN8. 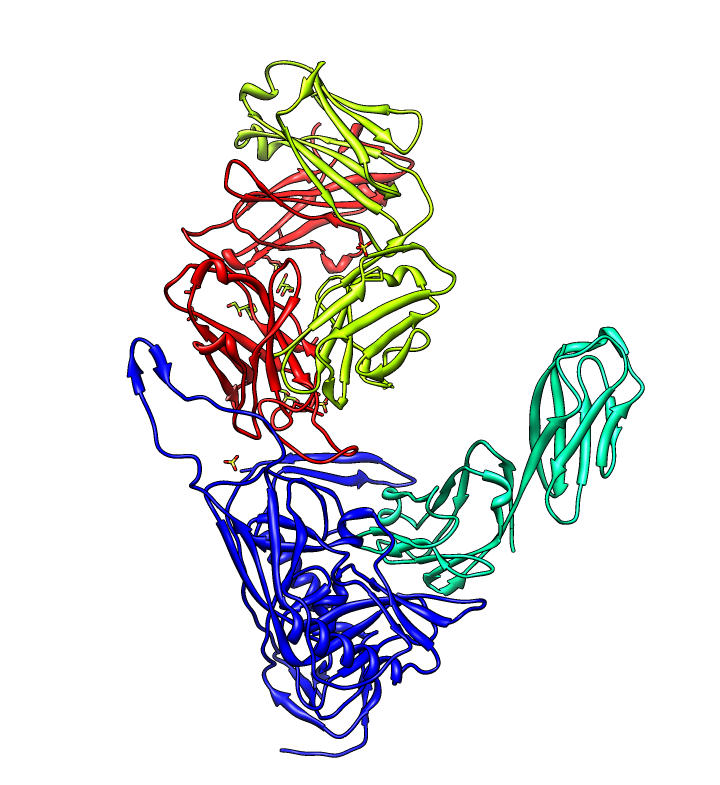 Binding of PG9 and PG16 antibodies believed to involve V1, V2 and V3 loops of gp120. 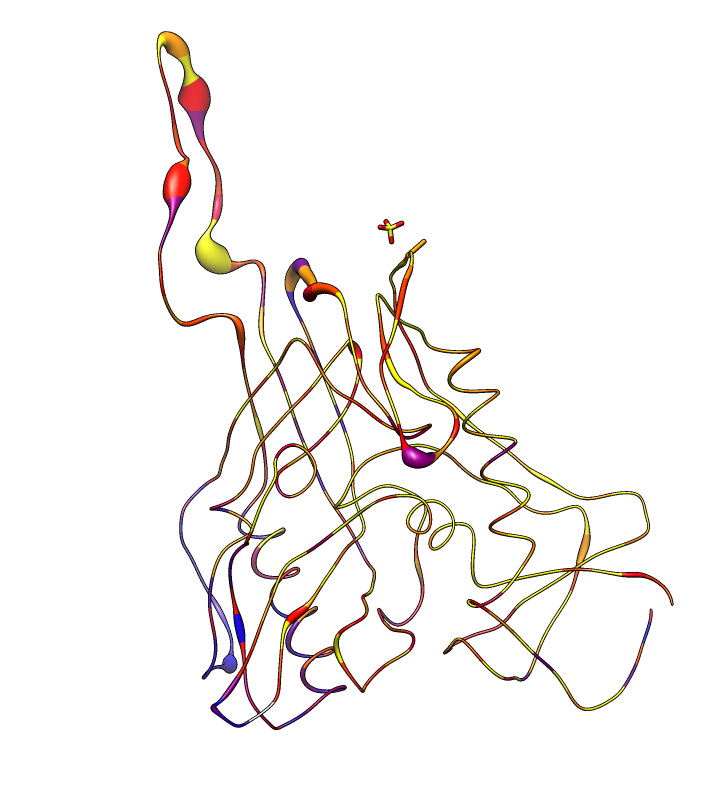 No structures have V1 or V2 loops (about 60 amino acids). 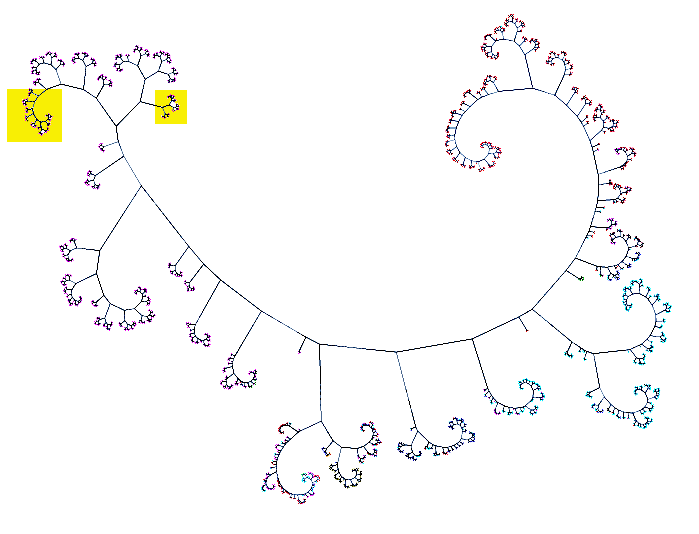 Look at a homology model, fetch ModBase Q9YQN8. Loops are unstructured because no template was known. Homology still useful for mapping conservation, alanine scanning, or glycosylation locations onto a full-length structure. Half the mass of gp120 is sugars from 24 N-glycosylation sites. 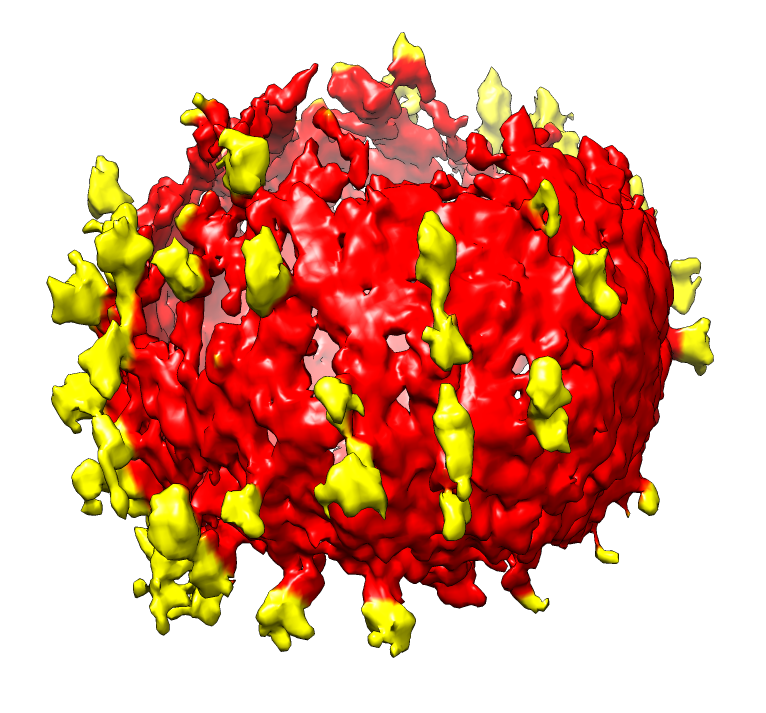 Glycosylation disguises virus from immune response. Also interacts with ligand binding. Glycosylation occurs on asparagines at residue triplets asparagine-X-serine/threonine. Glycosylation sites on ModBase homology model Q9YQN8 found with prosite match N-x-[ST]. Note 8 sites on V1/V2 loop. Long color bands are badly spaced (10A apart) residues in homology model. Consensus glycosylation model: Mass spectroscopy from Kenneth Tomer's lab (NIEHS) determined distribution of glycans (branched sugars) at each residue. Most common glycan for each residue used to hand-build a full length fully glycosylated model. 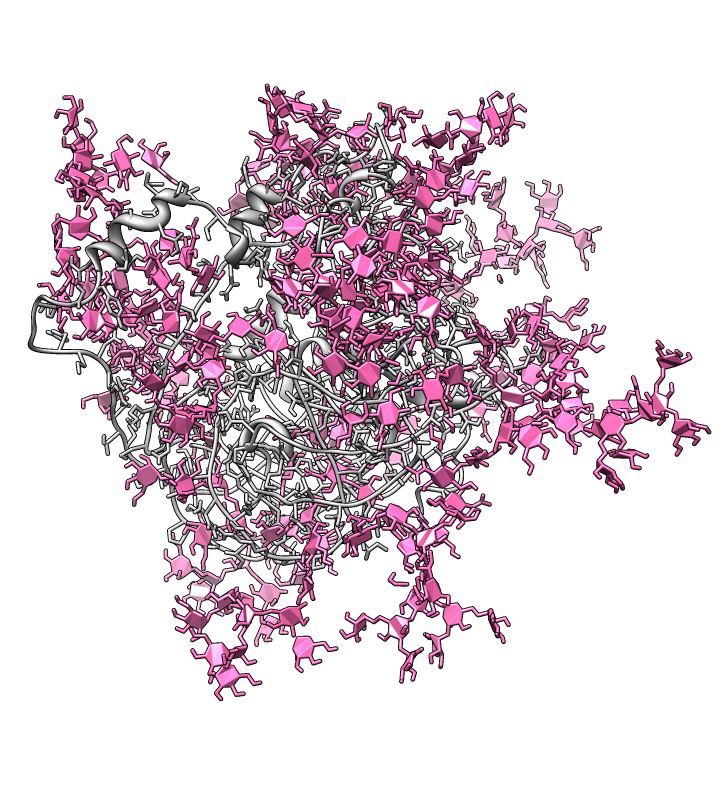 Glycans at binding sites. Locations of CD4 and FAB X5 by fitting 2B4C to glycosylated gp120 model. Glycosylation model errors. Alignment of 2B4C and hand-built glycosylated model. RMSD header shows differences between structures. V3 loops are very different in x-ray model (2005) and earlier glycosylation model (2000). 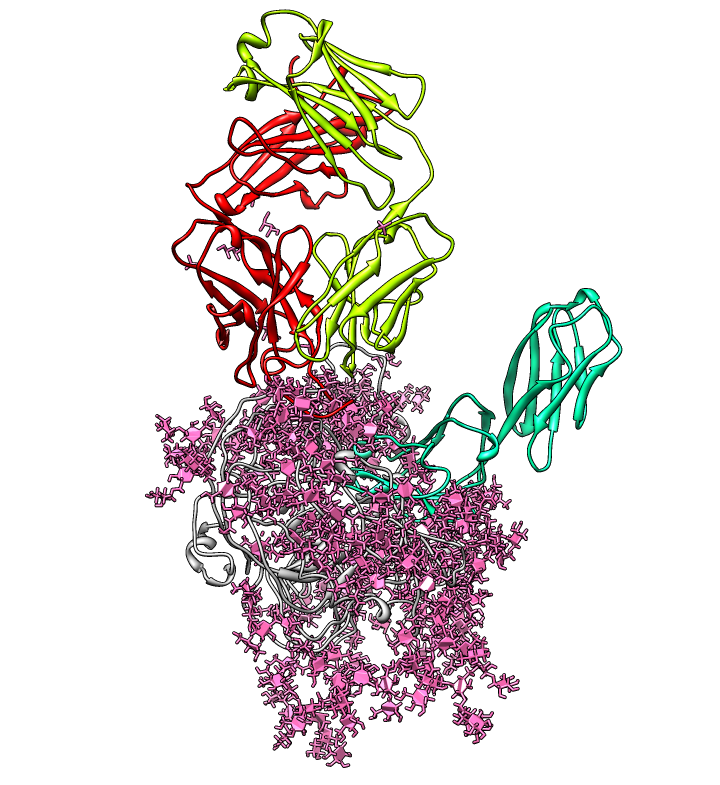 V1/V2 gp120 loops are important for antibody binding but not resolved in any crystal structures. 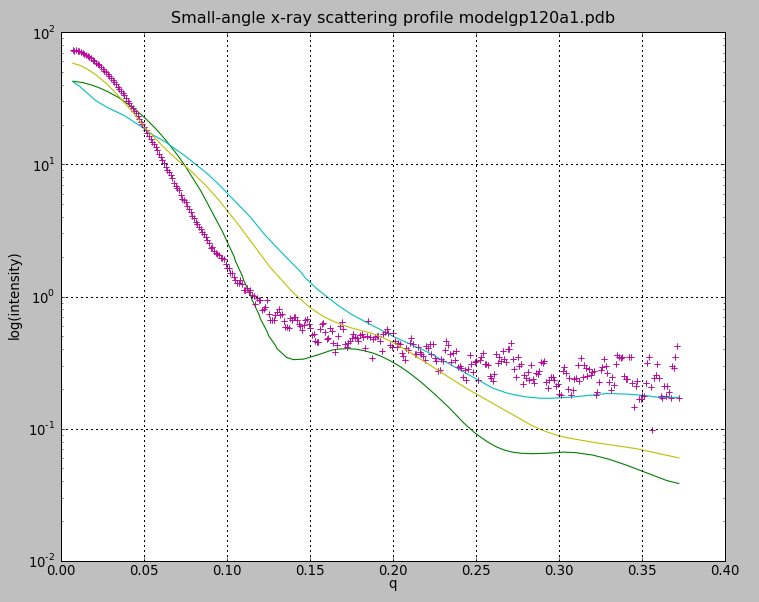 Small-angle x-ray scattering (SAXS) data may help identify loop location. SAXS data is acquired in solution. Data from Joanna Krueger of full length fully gycosylated gp120 and CD4-bound gp120. Simulated SAXS profiles for a molecular model can be calculated in Chimera and compared to experimental data. Calculation software developed by Dina Schneidman in Andrej Sali lab, UCSF. SAXS profiles. Experimental gp120 SAX data pink + marks, glycosylated model green, modbase homology model cyan, glycosylated model with moved v1/v2 loop yellow. Alternate V1/V2 loop models. Colors match calculated curves in SAXS profile plot. Model conformations can be tested against SAXS data. Likely that many conformations exist in solution and are averaged. SAXS data for CD4 bound gp120 also available from Joanna Krueger. PG9 and PG16 antibodies bind trimeric HIV spikes but not monomeric gp120. All previous gp120 neutralizing antibodies have bound monomeric spikes. 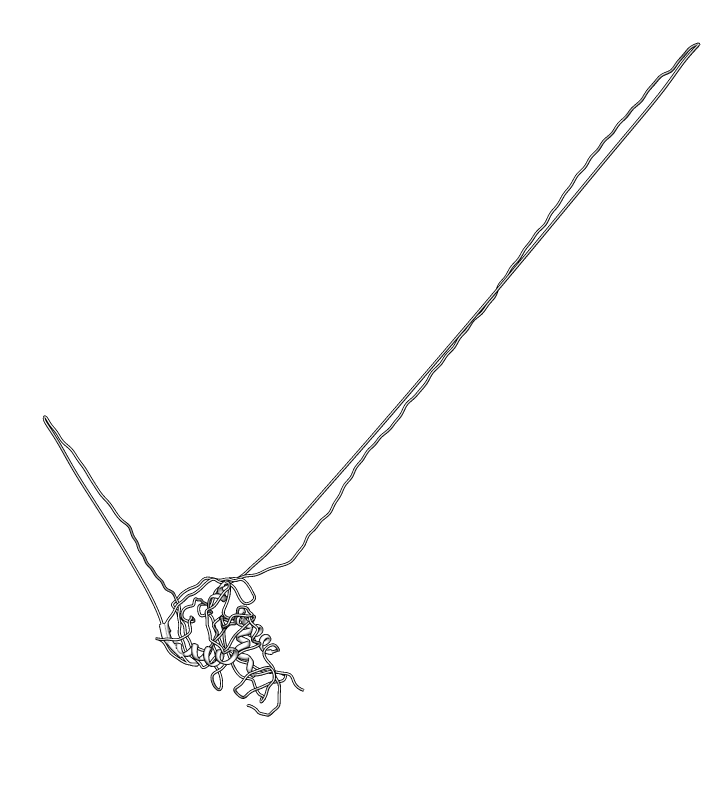 There are no trimeric spike crystal models. 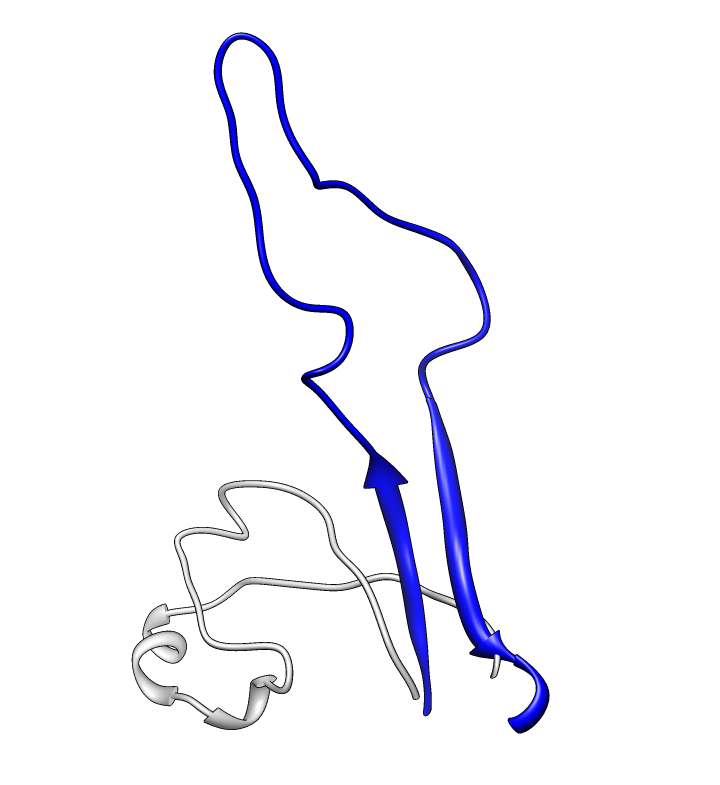 Trimer formation requires the gp41 transmembrane stalk. Structures of trimeric spikes come from electron tomography. SIV virions. SIV virus tomography from Kenneth Roux's lab. 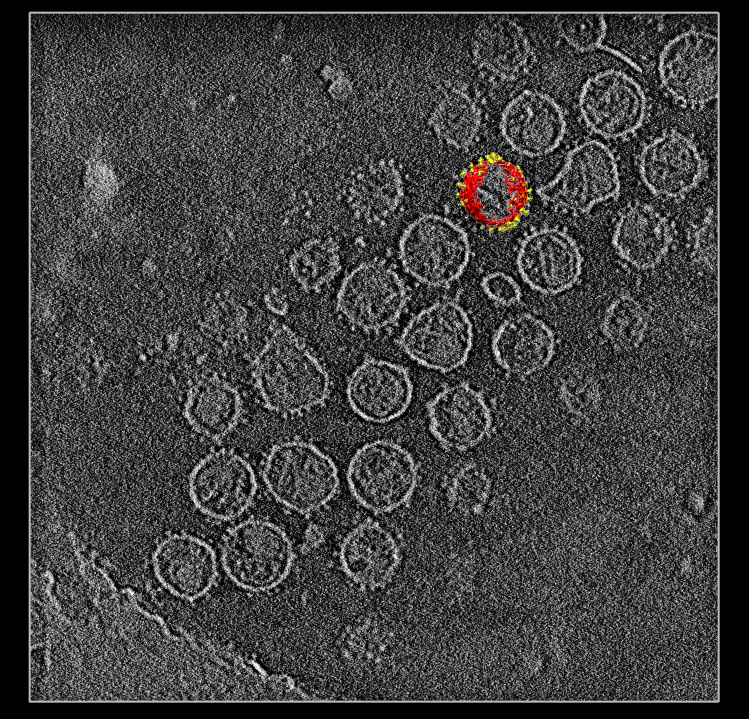 Single virus extracted from tomogram, smoothed, noise hidden, colored radially to show membrane (red) and spikes (yellow). Spikes from virus particles can be extracted from tomography, aligned, and averaged to produce a spike density map with improved signal to noise. Current data uses a few hundred spikes achieving 20 Angstrom resolution. Interactive spike picking can be done in Chimera. Aligning and averaging requires a computational pipeline not done in Chimera. Spike density maps can be fit with xray structures. Spikes with ligands bound show different gp120 orientation than spikes with no ligands. PG8 and PG16 antibodies only bind gp120 trimeric form. Conformations of monomers cannot be seen at 20 Angstrom resolution, only overall orientation. 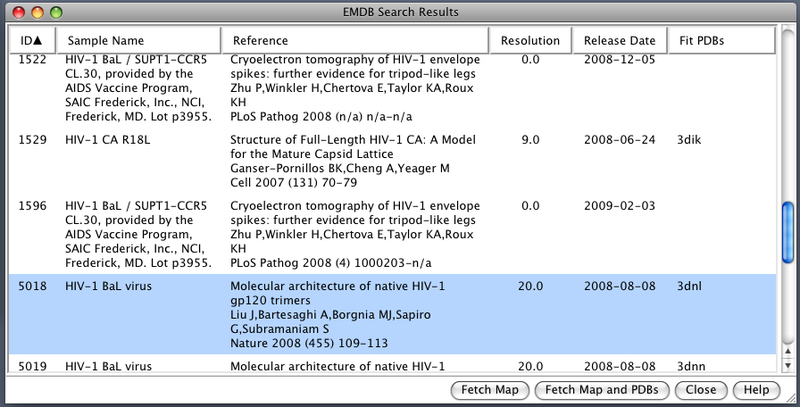 EMDB Search. EM Databank can be searched and maps downloaded directly from Chimera. Search term HIV. Spike with ligands. Spike with CD4 and FAB 17b bound. C3 symmetry applied after fitting monomeric xray model. Unbound spike. Binding induced motion. Rotation of 60 degrees about orange rotation axis on binding CD4 and 17b. 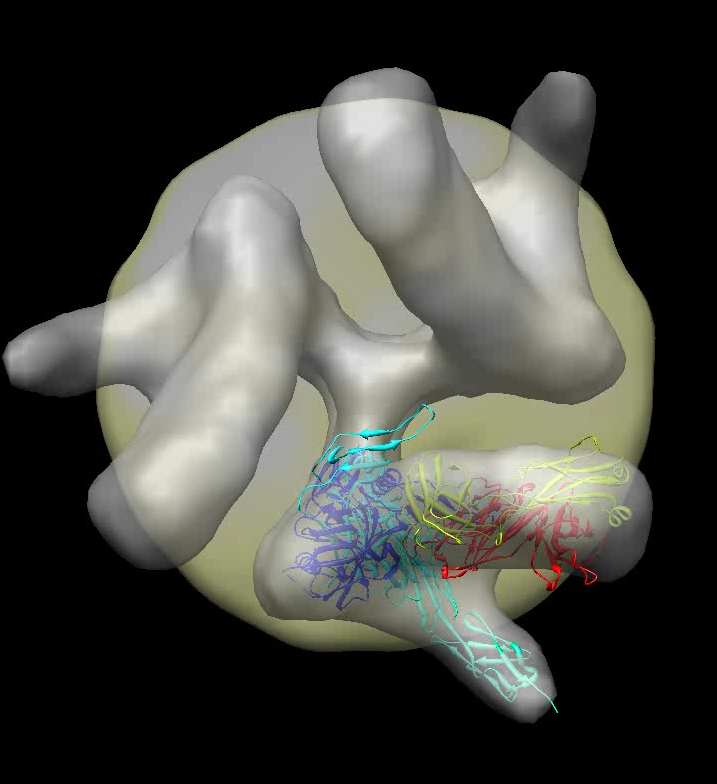 Simple animation can illustrates trimer motion on binding CD4 and FAB 17b. Script. Movie. Titling, fly-in of ligands, and fading EM surfaces can make the movie more self-explanatory. Script. Movie. 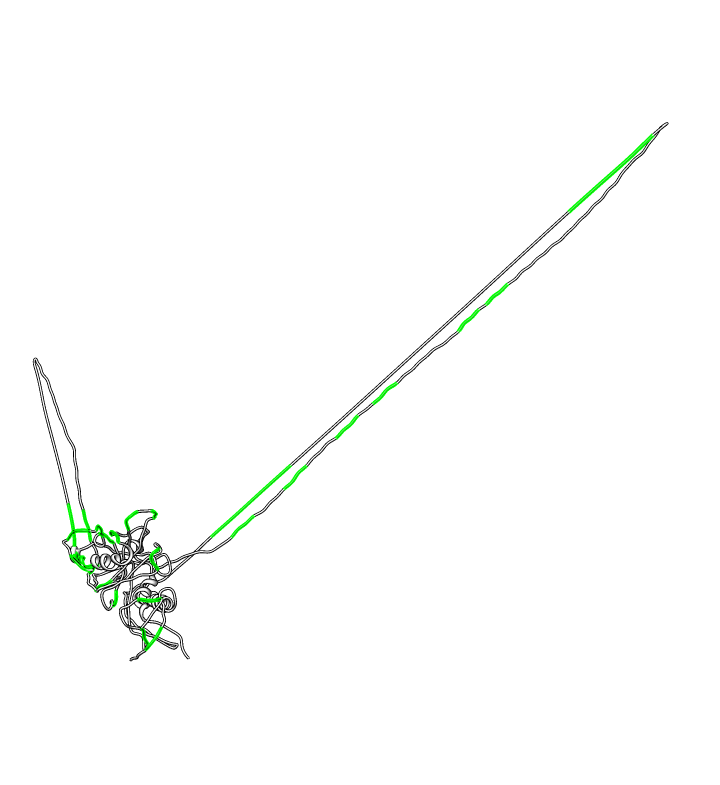 Animating rotation. 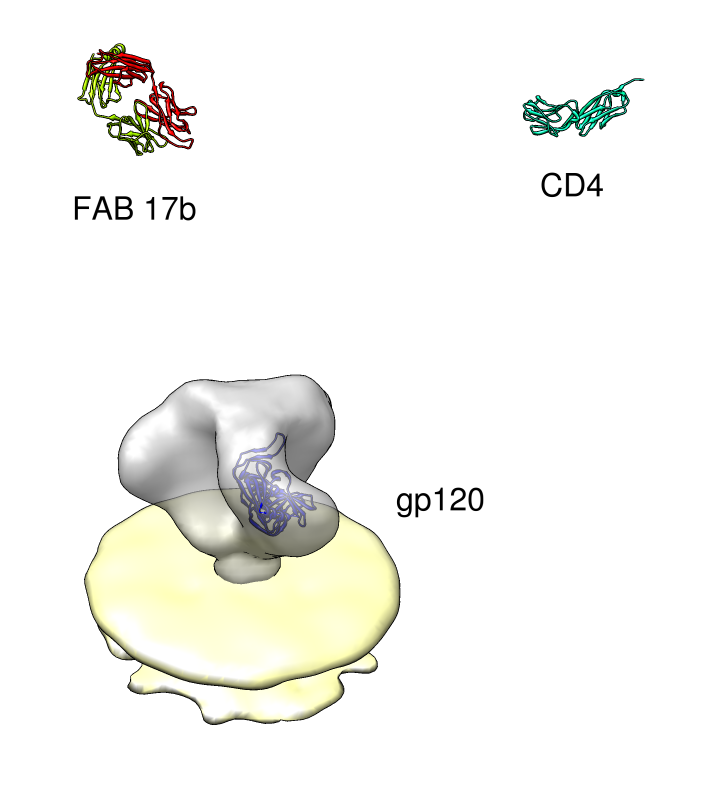 Minimal animation showing rotation of gp120 when CD4 and FAB 17b ligands bind. Fancier animation. Animation is made more self-explanatory by adding text labeling, fly-in of ligands, fading between unbound and bound density maps. 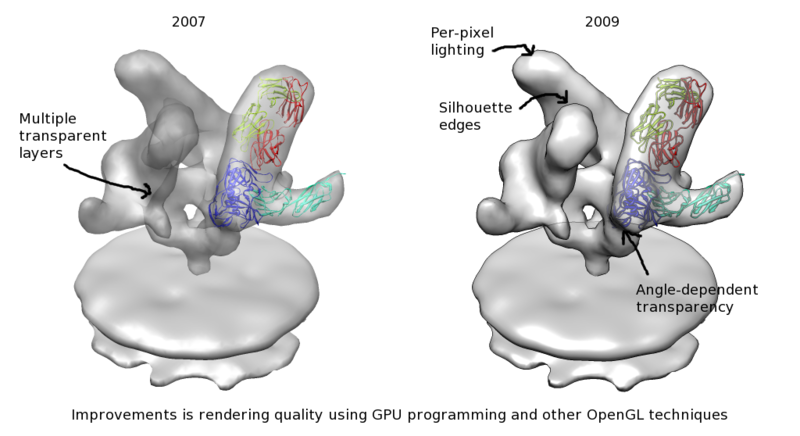 Improved graphics rendering techniques in Chimera give better three dimensional appearance in images made for talks and articles.